8 Critical Questions to ask a Financial Advisor before giving them your money – Praxis Advisory Group, Inc.
Finding the right financial advisor takes time. In order to feel comfortable and confident in the person managing your money, trust and transparency must be created between both parties. 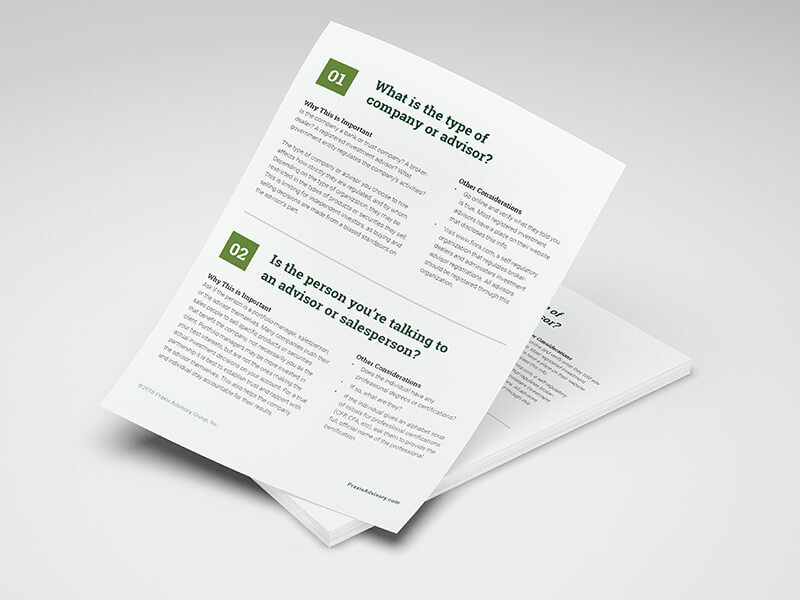 Download this resource to help you be more informed, focused, and confident in your evaluation of financial advisors—allowing you to quickly build trust with the right person and steer clear of the wrong fits. No email or personal info required. Subscribe to receive future resources, InvestAcademy class invites, and our Market Outlook newsletter. We have received your message and will respond shortly. Please allow up to 48 hours for a response. An error occurred when sending your message. We apologize for the inconvenience. Please give us a call at (303) 771-5002.